Currently when the world is passing through the deadliest Ebola epidemic ever, we are introducing Living drug, a permanent cure for Ebola. Living Drug contains perfect neutralizing antibody for Ebola Virus. 1 ml of living drug injection is enough to cure a Ebola patient for life time. Patient’s immune system starts a rally against the Ebola virus and the body starts curing itself. A freshly infected person gets cured in less than 13 days and a severe infection takes around 2 to 3 months for complete cure. Test for Viral infection turn negative for the patient after complete cure. Completely Cured Person is already immunized against the Ebola Virus and any further exposure to Ebola virus, immune system actively neutralizes the Ebola Virus before it develops the disease. Ebola Virus which can cause disease in humans, when treated with Living Drug (in a suitable medium) becomes completely inactive and is the perfect Vaccine candidate for humans. Any vulnerable patient treated with this vaccine becomes completely immune to Ebola infection. Vulnerable Host + Ebola Virus + Living Drug results in a Healthy Host and also perfectly immune to Ebola Infection. Ebola virus already exists inside a Ebola infected patient. 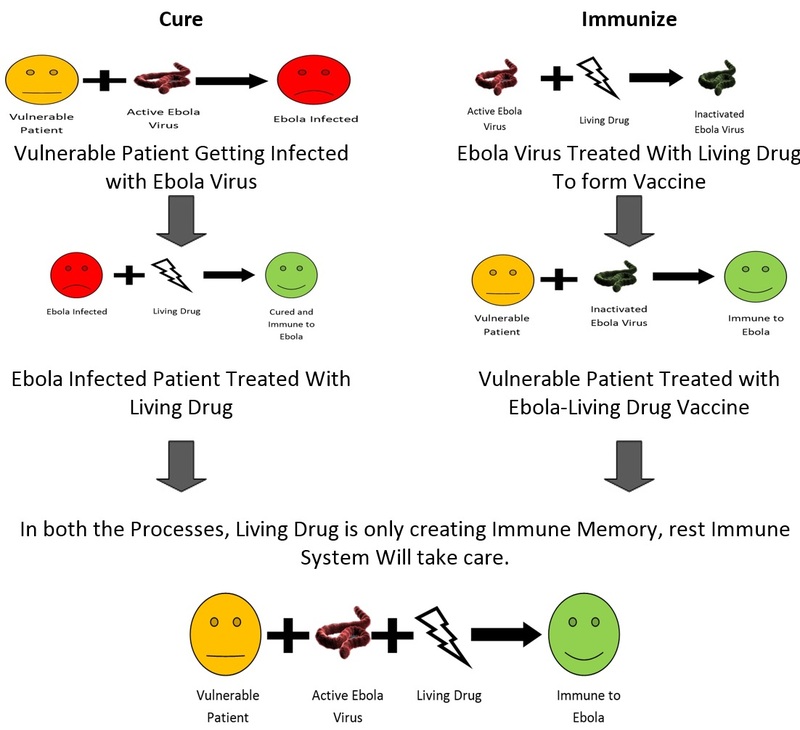 On exposing the patient with 1 ml of Living drug injection, living drug forms Inactive Ebola Virus inside the body(as active Ebola virus is already present in the body), which creates immune memory and immunize the immune system of the patient against the Ebola virus, and his/her immune system starts curing the body by itself. In this way, both Cure and Immunization follow the same process. If a Person is cured with living drug or Immunized with Ebola Living Drug Vaccine, he/she is always protected from future infections from Ebola Virus, as his/her immune system actively defends the Ebola Virus from developing the disease. In Living Drug therapy prevention is taken care by our own immune system. Living Drug therapy creates Immune memory against Ebola virus in our body, which helps the Immune System to detect the presence of Ebola Virus inside our body. Once Immune System is able to detect the presence of the Ebola Virus, Immune System will always make sure that our body is free from Ebola Virus. Basic Questions that come to my mind, when we listen to all the news regarding Ebola epidemic. What is the problem? Are we solving the correct problem? It reminds me of a famous quote. Definitely we have following answers for Ebola puzzle. 1. There is no Drug that is documented as effectively curing the Ebola infection. 2. We are hoping to get a Vaccine as early as possible which will solve all our issues. 3. We are not having enough funding to carry out the Ebola Prevention program. Definitely none of them showing any hope for getting any close to solving the problem. Lets start with some known facts and what are the findings which are deviating from the facts. We have a highly developed Immune system that protect our body from any foreign agent invasion. But in Ebola infection Immune System is not able to protect our body from developing the disease. So let us go into the process of controlling the Ebola Infection Using our own Immune System. What need to be corrected to bring back normalcy in our immune system. From the point of view of a disease control, distinctly our body contains 3 types of cells. Somatic cells or normal cells which function normal body functions and they are not involved in immune system activities, except when they are infected they show a flag of alert situation, so that immune system takes an action based upon its decision making. Surveillance cells are the primary defense mechanism of immune system which is responsible for catching the pathogens and generating Immunological memory. These cells act non-specifically which means they act in the same way irrespective of the type of pathogen. These cells are responsible for creating Immune Memory. Terminator cells are the secondary defense mechanism of immune system which is much coordinated and specific immune response against a particular pathogen, which is detected by the Surveillance cells and for which Immune Memory already exists or newly created by the Surveillance cells. Lets simplify the puzzle with an example. Lets take an example of a city which is fighting a terrorist gorilla war. City is our body, Ebola Virus is the Terror group. Somatic cells are normal citizens. Surveillance Cells are city maintenance forces like City Police and traffic police. Terminator cells are nothing but our army which only come into play after they get concrete report about the presence of the terror group. In a normal terror attack of known terror group, City Police or Traffic police identify the Terror Group based on Existing Criminal records and they inform the Army to assassinate the Terror Group specifically. In this way Major disaster is averted from occurring. But what if, there is no previous criminal record for a terror group, Surveillance forces can’t catch a member of the group, as they are not sure about identity of the new terror group. They take time to identify the new Terror group which is not specific and identification occurs by chance, which proceeds as below. For every known terror groups for which there is a criminal record, Surveillance forces do have a specific handcuffs (Antibodies). Which they use to catch hold of the criminal. But to catch a new terror group they need to develop new handcuffs based on the exterior shape of the unidentified members moving in the city. So it is a hit and trial method by the immune system, as it is not aware of the vital spot of the new member. If the Hit and trial method is successful then Surveillance system can catch hold of a member of the new Terror group and lodge a case and alert the army and problem is solved. But the success of the new terror group lies in its ability to successfully hiding its vital spot and misleading the immune system by exposing in-penetrable surface, handcuffs (antibodies) against which can’t arrest its movement, in turn immune system can’t catch hold of it, as result it can travel freely in the new city and Surveillance system is always attacking on a place where terror group will always win. In simple words, our immune system can never develop a antibody against a hidden target and so it can never be able to catch hold of the pathogen and as a result it can’t develop a immune memory and as a result secondary immune system action can’t be triggered and hence immune system is inactive and in the meanwhile Ebola virus is damaging all the cellular systems of the body of which immune system is also a part. So our problem is, Can we find an antibody which can’t be developed by immune system in presence of Ebola virus in the body, but it can attack the hidden target of Ebola virus. If we supply that antibody to the body it attacks the hidden target of Ebola Virus and immobilizes it inside the body and surveillance cells can catch hold of the Ebola virus and create an Immune Memory for Ebola Virus and which is the starting point for Terminator system activation to specifically target and clear the Ebola virus from the body. We would like to provide our view on these methods, why these methods are not close to perfection. Let me explain, why we call it as chemotherapy. Any chemical that is used to control the Ebola Virus have following distinct disadvantages. They are not utilizing the mechanism of the body, they are directly attacking the virus. If a person is cured using chemotherapy, on relapse of the same disease, patient has to go through the same medication or a higher dosage. Clearly, this system is not communicating anything to the body. On a long term note and efficiency note this method is the crudest method to cure Ebola infection. Our body has the ability to cure the disease and eliminate the Ebola virus, but Chemotherapy is not utilizing any one of these mechanisms, it is like in a digital world using analog signal. It may sometimes serve our purpose, but it can never communicate with the digital system, they are not compatible at the core. Current Vaccine technologies concentrate on immunizing the vulnerable host before the commencement of actual infection by supplying a different variant of the pathogen. There is no relevance between the curing of infected person and immunizing un-infected person. It addresses immunizing un-infected person, but not curing the infected person. If it can immunize before commencement of the infection, why it can’t immunize during or after the infection and change the tide in favour of the host immune system and eventually cure the infected person. Most of the vaccines have a success rate of 50%-80% and they need separate procedure for finding out its effectiveness. Current procedure is, If vaccine is not developing a disease then it is effective, why not a vaccine can cure an infected person every time then we can successfully prove 99% effectiveness of the vaccine. It is the most promising method, provided we are using the right antibody. Current methods are using a cocktail of antibodies. How these antibodies are identified is the base idea, these antibodies are identified based on the antibodies that are produced in a host when Ebola Virus is injected into it. Out of all the antibodies that are secreted in the host, we are identifying best options and utilizing them as a drug. What if Ebola virus is successfully hiding its vulnerable targets which means immune system of the host can never produce required Antibody. Total search space of these Antibody cocktails is a question mark. Are we searching at the right place? Above statement may confuse you, but it is the summary of this total document. Let’s go back into our previous discussion on Ebola Puzzle, there we have concluded that we are searching for an antibody which can attack the hidden target present on the Ebola Virus. Before going to discuss about the Antibody, let’s discuss regarding the hidden target. To explain why it is a hidden targets, we need to take the example of ‘Turtle Defence’ model. Turtles have a shell to protect themselves. They live in two ways, during favourable time they come out of the shell and during adverse times they withdraw into the shell and close all the openings. In the similar way, Ebola virus has two stages, favourable time when it is present inside a cell and adverse time when it is present outside cell i.e traveling from one cell to another cell. During favourable time i.e. inside a host cell, Ebola virus is in the comfort of host cell infrastructure and it assumes there is no threat from immune system, and utilizes the resources to multiply its generation. It doesn’t require a shell to protect it. Whenever Ebola virus completely destroys a host cells it is visible to the host immune system and it is the adverse situation for it. It covers itself with the shell which is already synthesized and moves in the medium with the flow till it gets attached to another host cell and infects it. During movement it is shielding the immune system attack with its armour, and immune system can only see the armour but not the complete microbe. Immune system can only produce antibodies to the surface, which it can see or sense. If we can notice the Turtle model even though it has head, legs and tail, during defence mode only shell is visible. Immune system can only see the shell and only produces the antibody against it but not the complete organism, as it is not able to see it completely. Keeping the targets hidden is the strength of the Ebola Virus. We need to break the defence system of the Ebola Virus in order it to be visible to the Immune system completely. But right Antibody can’t be synthesized by Immune System which is the reason Ebola is winning every time. Immune system needs a correct antibody supply from outside. So, let us discuss about the antibody that we are searching for. Let ‘N’ be the number of elements present in the universal set of targets to which any antibody can get attached. Let ‘X’ be the number of elements in the set which contains all the actual targets present on the Ebola Virus. Let ‘Y’ be the number of elements in the set containing number of targets identified by the immune system and hence developed Antibodies against them. Here following is the relation which is always true. Here search space ‘Y’ is the explored area by all the organizations and from which Cocktail of Antibodies were selected and are being used for Ebola treatment. But our research says that value of ‘X’ and ‘Y’ is not equal, and the relation is as follows. Clearly immune system is not identifying all the targets present on the Ebola Virus, if we think from the Virus success point of view, Ebola Virus is not showing all the targets to immune system. We have two distinct search spaces, space ‘Y’ which is extensively used in the Antibody Cocktail projects and set ‘X-Y’ which is the search space for Living Drug project. First we will see what is happening in the Antibody Cocktail project and after that we will discuss Living Drug Project. Let’s say time taken by Ebola Virus to travel from one cell to another cell be denoted by TE. Any antibody from the set ‘Y’ (which is being utilized in Antibody Cocktail Projects) gets attached to the shell surface, and it will not hinder the movement of the shell. So it is nothing but TE. It is known fact that, antibody can’t kill the microbe by itself, it is just a marker and it informs immune cells to attack the target it got attached to. Immune cells attack takes considerable amount of time. Let’s say TC is the time taken by the immune cells to attack the antibody-Ebola complex. Here the value of TE is very small than the value of Tc. It means by the time Immune cells get hold of the target, Ebola Virus transfers its genetic material into a new cell leaving behind empty shell. Empty shell is a dead particle, hence immune system cells can’t carry out any further analysis. Added to the complexity, most of the mutations of the virus are expressed in the set ‘Y’ zone, which leads to change of the target. These projects are trying to optimize the effectiveness of these antibodies by using multiple antibodies from this search space ‘Y’ so that combined antibody attachments may hinder the movement and also increase the probability of capturing the complex. But distinct disadvantage in this method is, when the virus is in shell mode, even if immune cells capture the virus, its enzymes can’t break the Ebola Virus shell, because of which total approach may fail. This reminds me of a favourite quote. The problems with our so called genius approach is, we don’t know the boundary of our search space ‘X’. Living Drug project utilizes a search space which is not utilized earlier, i.e. (X – Y) search space, which is as good as searching (N – Y) search space. Let’s take the turtle defence mechanism as example again. When the turtle is not in defence mode, its head and legs and tail are visible. Our antibody can only get attached to a place and it can’t kill or cause damage, so how we can make use of antibody to identify and also to slow down turtle movement. If we target tail, there will not be any change in its movement speed. If we target its legs there can be hindrance in movement but it can move. If we target respiratory opening then it can’t move after sometime, and it has to take rest. But these antibodies are never synthesized by immune system as it can’t see these targets. But we can supply it from outside. In the same way living drug targets a vital spot on actual Ebola Virus which makes it immovable. During its movement from one cell to second cell, it can’t enter a new cell. Let’s say TEL is the time taken by Ebola-Living Drug complex to move from one cell to another cell. It provides enough time to Immune system surveillance cells to acquire the antibody-Ebola Complex and now immune system can attack the Ebola Virus and kill it and create an immune memory which is the starting point for Immune system rally against Ebola virus. Total cells of the Immune system start a coordinated attack on Ebola Virus till the last Virus particle is removed from the body. Body requires good food and healthy life style to accelerate the process, body is completely equipped to defend itself. Time for another Favourite quote to end the discussion. But because of our approach, what is going to change. Innovation is of no use if it is not simplifying existing problems. Only 1 ml of Living Drug is enough to cure a adult Ebola patient. Small scale Manufacturing requires a maximum of 25 days for one batch and it costs between 15$ to 20$ per 1 ml. Large scale manufacturing can produce continuous supply and costs can be brought down to 3$ to 5$ per 1 ml. Till today we are taking medicines to cure a microbial infection and using a vaccine to keep the body informed about the microbe beforehand and following preventive methods to prevent the microbial infection. They are not at all related to each other. Living drug is going to connect all the three. Continue reading each page for further details. Till today, we are having two separate methods for managing microbial infection. Drug: Use drugs for curing it, if we are infected with a microbe. Vaccine: Use vaccine for immunizing the patient before the actual infection. But vaccine and Drug are not related to each other. Living Drug connects drug and vaccine. A drug which creates a vaccine inside an infected person. In traditional Vaccine methods we are not using the actual microbe but one that resembles it. Why can’t we use the microbe directly? It is the argument put forward by Living Drug project. Living drug contains an antibody which when comes in contact with the Ebola Virus, it inactivates the Ebola Virus, converting it into a vaccine. The advantage of this approach is, if we take an infected person immune system current state, it is nothing but vulnerable host + Ebola Virus. Our Immune system just requires an inactive Ebola virus to create an Immune memory. On supplying Living drug to the infected person, Living Drug creates inactive Ebola Virus inside the body. Immune system can utilize Inactive Ebola Virus to create immune memory, which can activate terminator cells of the immune system to actively eliminate Ebola Virus from the body. Only 1 ml of Living drug is enough to cure an infected person and also immunizes his body against Ebola Virus. If a person is cured using Living Drug, he is already vaccinated. Time taken to cure an infected person is directly proportion to the extent of infection, i.e a fresh patient gets cured within 13 days and severe late stage infection requires a maximum of 2 to 3 months. Once cured using Living drug, all the viral infection tests turn negative and total normalcy is restored in the body. Here comes a new innovation in Vaccine technology. If you notice our Description of the page, we didn’t use vaccination but we used Immunize. Reason behind not using Vaccination is, Vaccine technology is a questionable approach, which is old methodology and a new and more efficient method need to replace it. Vaccine technology has following disadvantages. Success rate of a vaccine always ranges from around 50% to 80% but it is never 99% successful, theoretically also we can’t guarantee that. Clinical trials for a vaccine is an indirect process, i.e. if on administering the vaccine on a host, if it is not developing any symptoms of the disease then we are concluding it as effective but our argument is why it can’t cure an already infected person? There is no relation between, cure and vaccination. Immunization using a vaccine is a Passive Immunization method, as we are not using the actual microbe and when real infection is encountered, vaccine success rate of the vaccine is not 99%. Living drug is going to change the way we look at vaccination rather we call it as Active Immunization. In a suitable culture medium, when we treat, Virulent Ebola Virus with Living Drug, Resultant complex is a Inactivated Ebola Virus, which retains all the properties of the Ebola Virus, except that it can’t infect a person and a perfect vaccine candidate. Living Drug-Ebola Virus Vaccine effectiveness can be proved by treating infected person with this new type of vaccine, which activates the immune system and also cures the infected person, in this way 99% success rate of the Vaccine can be tested, which we call as Active Immunization. We are always using the original microbe, and we can guarantee the success rate of the Vaccine. We are following number of procedures to prevent the Ebola Virus from infecting us which we call as passive prevention, but real problem lies in our body, because our immune system is vulnerable. If our immune system can always defend itself, we do not have to worry about following procedures which are not 100% fool proof. Living Drug provides cure for an infected person and also a vaccine for an uninfected person. Any patient undergoing either of the treatment develops active immunity against Ebola Virus. On subsequent exposure to Ebola Virus, body readily defends itself, as our immune system has developed immune memory for Ebola Virus and active surveillance is in place for Ebola Virus. Immune system gets activated, each time Ebola Virus is detected in the body and actively defends and kills it, making sure that Ebola Virus will never develop a disease. A patient who is treated using Living Drug or Immunized using Ebola-Living Drug Vaccine, will always develop Immune memory against Ebola Virus and his body will always defend Ebola Virus, on subsequent exposures to the virus. Here Prevention carried out by the immune system is an active prevention and is the best way to prevent any viral infection. Please check Final Word page. I thank god that we have seen the end of this ebola saga, but I hope we’ll not rest until we see. The end of the other one that’s most dreaded one HIV AIDS, may the Lord help the world. Our project can provide a solution to these diseases. Please spread the word about our project. You can help us in reaching that goal. Same time span and resources. We will upload a video with all the details of our research in 2 weeks time. It can provide all the details u r looking for. Hi, please check Final Word page. To test on patients we need to take FDI approvals. We don’t have access to resources like laboratories and funding to carry out these activities. We r trying our best to get them. After that it can tested and proved. Theoretically it is possible, supporting Clinical Trials need to be conducted to confirm our Research. We thank god. For this. Livng Drug project is a Dr.Anem Labs initiative to deliver an affordable and efficient drug for Ebola Treatment.